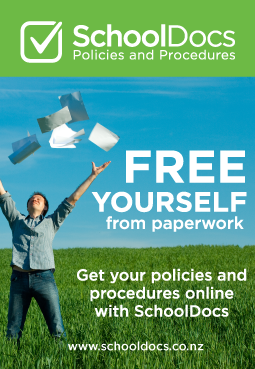 SchoolDocs provides online policies and procedures to hundreds of primary and intermediate schools in New Zealand. Each SchoolDocs school receives their own unique website for their policies and procedures. The core elements of the policies and procedures are common to all of the school websites, however each school adds a customisation layer for their school-specific character and other differences. Customisation includes the school logo, site-specific details (such as location of the first aid kit), and school-specific details (such as their behaviour management plan). All schools are supported by SchoolDocs with regular advisories and reminders, sophisticated online consultation tools, and updates to the core elements of the policies and procedures in their sites. Online collaboration tools mean that individual schools benefit from the contributions of the wider group, and vice-versa. SchoolDocs is owned 50:50 by Streamliners and two respected educationalists. For more information about SchoolDocs please visit www.schooldocs.co.nz.